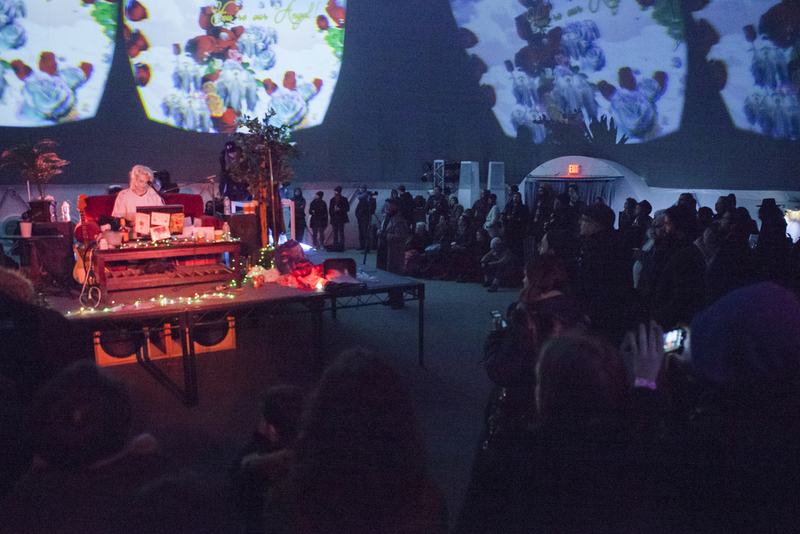 IWD was performed twice in 2015 at PS1 MoMA in NYC and at Compliance Division in Portland, OR. "I Wanna Destroy" at PS1 MoMA in NYC. Photo by Margarida Malarkey. I Wanna Destroy is tied together by setting up parallel worlds. “Outside” the majority of the audience members experience a brand new song cycle by EMA, playing on a stage set up to look like a shabby apartment. One at a time participants don the mask and enter virtual reality to find another layer of the outside narrative. “Inside” the 3D environment is rendered to match the stage set up. There is even an avatar of Anderson on the couch that tracks her motions. The participant's visual experience in VR is projected back out into the venue, becoming part of the show. themes of family, guilt, illusion and isolation. For live audio, press reviews and more information please click here.